Thor actor Chris Hemsworth welcomed Deadpool and Ryan Reynolds to the Marvel Cinematic Universe in a great social media post. While the Merc with a Mouth is under the Disney umbrella now, it isn't clear just where he's going to fit in. While fans would love to see the character ham it up with Thor and the rest of the crew in Avengers: Endgame or in a future MCU project, it seems unlikely due to Wade Wilson's gravitation towards foul language and taboo topics. 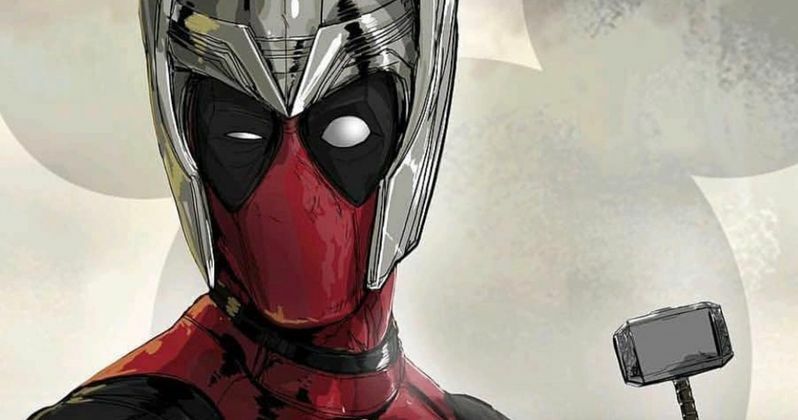 To welcome Deadpool to the MCU, Chris Hemsworth posted some fan art of the Merc with a Mouth wearing Thor's helmet while carrying a tiny version of Mjolnir. There's no way that he'd be able to lift the real hammer. In the background of this image, one can see the ominous Mickey Mouse ears looming and welcoming Wade Wilson to the fold. The Thor actor captioned the photo by saying that it was their "love child." Hemsworth and Reynolds have a friendly relationship and have traded posts on social media more than a few times over the years. If Deadpool gets integrated into the MCU and hangs out with Captain Marvel and Black Panther, it more than likely won't happen for a few years. Even with big properties like X-Men and The Fantastic Four, who don't have any vulgarity issues, it's going to be a while before Kevin Feige and Marvel Studios figure out how to move forward. It's an exciting time for Marvel fans who are ecstatic to see more of their properties back under the same roof for the first time in decades. Disney CEO Bob Iger has talked about an interest in putting out R-rated material and a cash cow like the Deadpool franchise is not going to be ignored. However, the Merc with a Mouth may continue to be separated from his MCU counterparts by having his movies put out under a different banner, perhaps one that even keeps the Fox name, but still under the Disney umbrella. In the end, it's going to be interesting to see how everything slowly starts to take shape now that the deal has finally closed. As for the future of Deadpool, there is the possibility of a third movie and the often-talked about X-Force movie too. Drew Goddard is still attached to the latter project and it is believed that the Deadpool franchise is one of the only Fox Marvel properties that won't be getting a full reboot now that everything has transitioned to Disney. This is good news, but it could be a while before we end up seeing either project, or at least until the dust settles. For now, it looks like everybody is pretty excited to see some of the other Marvel properties come home. You can see the welcome message to Deadpool below, thanks to Chris Hemsworth's Instagram account.